Raumfahrt+Astronomie-Blog von CENAP - Blog: Astronomie - Ist die Milchstraße eine Ausreißer Galaxie? Astronomie - Ist die Milchstraße eine Ausreißer Galaxie? Astronomie - Sind Merkurs Pole eisiger als Wissenschaftler gedacht? UFO-Forschung - Trepang 1971 UFO Fotos versenkt! The most-studied galaxy in the universe — the Milky Way — might not be as “typical” as previously thought, according to a new study. The Milky Way, which is home to Earth and its solar system, is host to several dozen smaller galaxy satellites. These smaller galaxies orbit around the Milky Way and are useful in understanding the Milky Way itself. Early results from the Satellites Around Galactic Analogs (SAGA) Survey indicate that the Milky Way’s satellites are much more tranquil than other systems of comparable luminosity and environment. Many satellites of those “sibling” galaxies are actively pumping out new stars, but the Milky Way’s satellites are mostly inert, the researchers found. 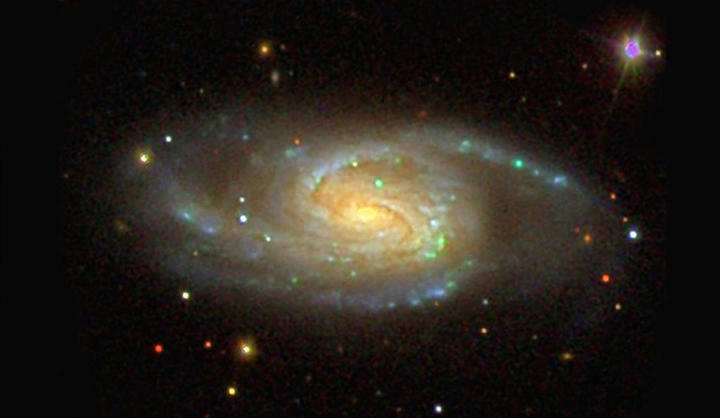 This is significant, according to the researchers, because many models for what we know about the universe rely on galaxies behaving in a fashion similar to the Milky Way. The SAGA Survey began five years ago with a goal of studying the satellite galaxies around 100 Milky Way siblings. Thus far it has studied eight other Milky Way sibling systems, which the researchers say is too small of a sample to come to any definitive conclusions. SAGA expects to have studied 25 Milky Way siblings in the next two years. Other SAGA team members are Yao-Yuan Mao of the University of Pittsburgh, Erik Tollerud from the Space Telescope Science Institute, Benjamin Weiner of the University of Arizona, Rebecca Bernstein and Yu Lu of the Carnegie Institution for Science, Ben Hoyle of the Max Planck Institute for Extraterrestrial Physics, Sebastian Marchi and Ricardo Munoz of the University of Chile, and Phil Marshall of SLAC National Accelerator Laboratory. All are co-authors of the study. Astronomie - Ist die Milchstraße eine "Ausreißer" Galaxie?